My 7 year old daughter and I were having our breakfast on the front porch when all of a sudden three very large deer came galloping thru our yard being pursued by a very large fox. We were in shock as they all came thru the garden I was just tending. Would a fox try to eat a deer and one so large? From what I've read about fox they would not try anything larger than a very baby deer but even then I thought they ate mice and small rodents. a few minutes after this parade, a tiny fawn poked his nose out of the woods and crossed the street into the deeper woods. Is it possible the deer were trying to take the fox away from the fawn? That happens in some animals but I'm not sure about deer. Any help would be appreciated. That sounds like a mismatch to me. Maybe the fox was having some success chasing the deer away from the fawn, was going to circle around and go back for the small, young animal. I'm not the expert, but that still sounds pretty ambitious for a fox. Coyote are another matter all together. 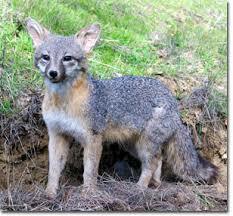 Also, I have seen some coyotes here in NC that are darker and closely resemble a gray fox. I'm sure it was after the fawn. A few years ago we had a fox on our front walk who was pursuing a flock of wild turkeys passing through our yard. And I've seen them go after chickens, too. We have friends with chickens, and foxes get a lot of them. Once a fox was after their chickens while we were there. We kept chasing the fox away, and it would come slinking right back. They can be very relentless in their pursuit, and not fearful of humans at all. But I think most of them probably have better luck with mice/rats/chipmunks/squirrels. A fawn would be a challenging kill; mother deer are extremely aggressive when protecting their young. They will even kill dogs, we had one after our dog one day, and another friend lost their dog to a deer. I would have to agree that the fox you saw was more likely an off-color coyote. A fox is comfortable sticking to rodents and very small game. If it was a fox and not a coyote, I would say the fox was rabid - I can't see why a fox would chase a deer - its way too big to take down on its own. Fox usually go after small game like birds and hens, and steal food like eggs and dog/cat food left out, and aren't above scavenging in dumpsters. To actively chase a deer is odd, plus there have been rabid fox reports in north Raleigh, so a rabid fox in Chapel Hill is not out of the question. 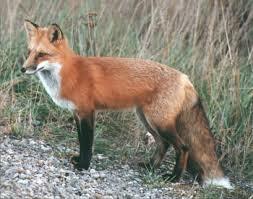 Foxes aer nocturnal and, as a general rule are afraid of human beings. They also tend to pounce on their victims - sneak and pounce. Agree, sounds like a coyote. Years ago I was in our front yard and heard this noise like a loud baaaa of a lamb. I turned around to see a coyote taking down a fawn and its mother frantic nearby. I was so mad at that coyote. We chased the coyotee off and the fawn rejoined his mom. 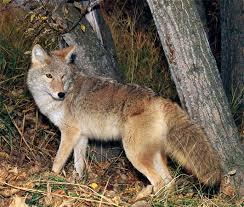 Many Coyotes are red, they can range from grey to red. Sounds like a yote. Foxes are mostly nocturnal as are yotes but yotes will hunt daytime. Generally, coyotes are the size of a medium size dog (German shepard or a bit smaller) while foxes are the size of a large cat. I wish these pictures had something to give a size comparison.